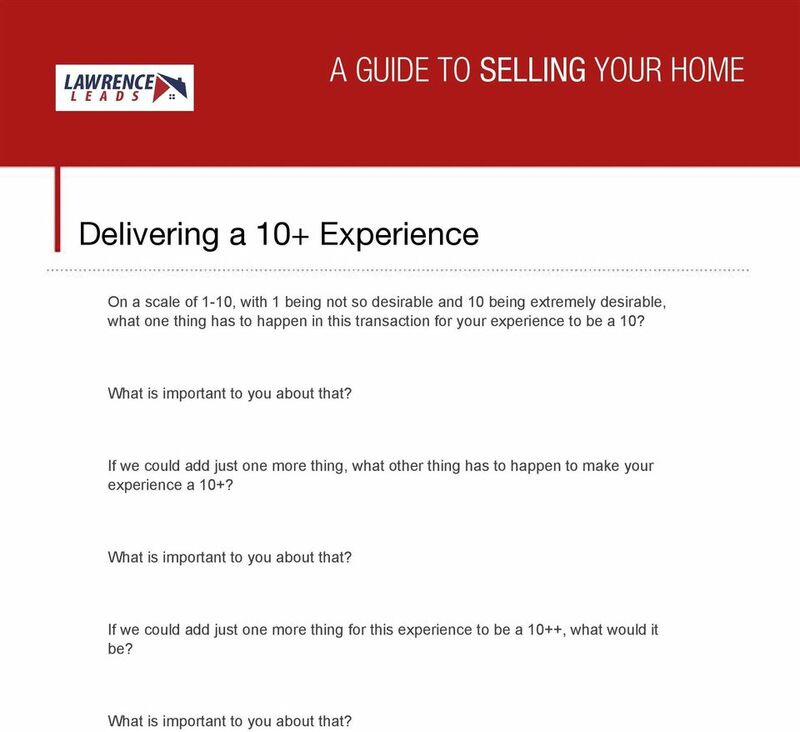 Download "A GUIDE TO SELLING YOUR HOME"
2 Delivering a 10+ Experience On a scale of 1-10, with 1 being not so desirable and 10 being extremely desirable, what one thing has to happen in this transaction for your experience to be a 10? What is important to you about that? If we could add just one more thing, what other thing has to happen to make your experience a 10+? What is important to you about that? If we could add just one more thing for this experience to be a 10++, what would it be? What is important to you about that? 3 How Does Someone Win or Lose With You? 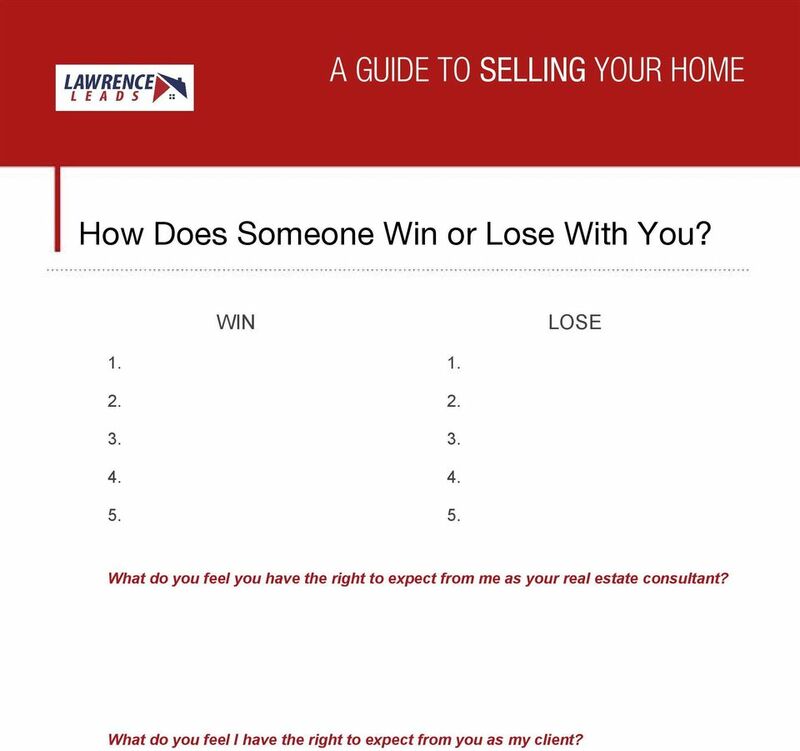 WIN LOSE What do you feel you have the right to expect from me as your real estate consultant? What do you feel I have the right to expect from you as my client? 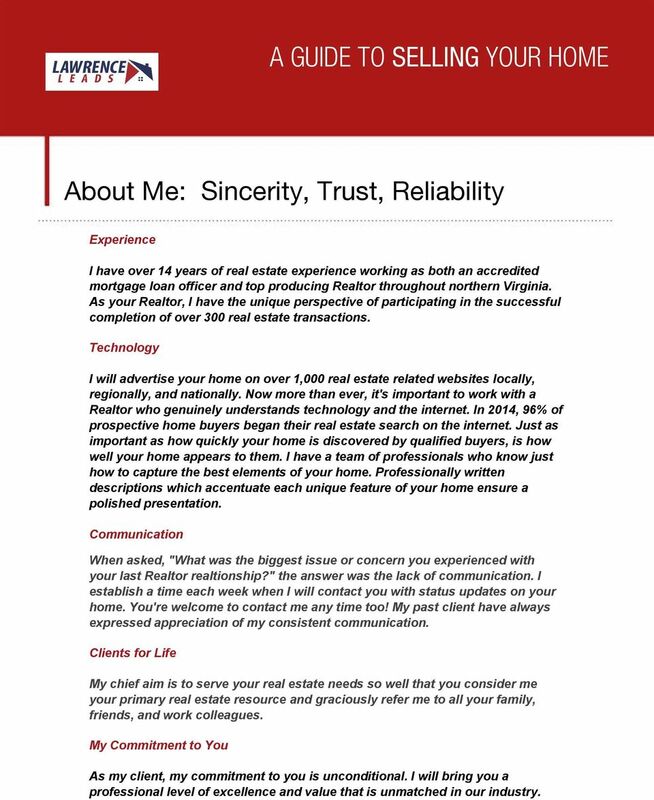 4 About Me: Sincerity, Trust, Reliability Experience I have over 14 years of real estate experience working as both an accredited mortgage loan officer and top producing Realtor throughout northern Virginia. As your Realtor, I have the unique perspective of participating in the successful completion of over 300 real estate transactions. Technology I will advertise your home on over 1,000 real estate related websites locally, regionally, and nationally. Now more than ever, it's important to work with a Realtor who genuinely understands technology and the internet. In 2014, 96% of prospective home buyers began their real estate search on the internet. Just as important as how quickly your home is discovered by qualified buyers, is how well your home appears to them. I have a team of professionals who know just how to capture the best elements of your home. Professionally written descriptions which accentuate each unique feature of your home ensure a polished presentation. Communication When asked, "What was the biggest issue or concern you experienced with your last Realtor realtionship?" the answer was the lack of communication. I establish a time each week when I will contact you with status updates on your home. You're welcome to contact me any time too! My past client have always expressed appreciation of my consistent communication. Clients for Life My chief aim is to serve your real estate needs so well that you consider me your primary real estate resource and graciously refer me to all your family, friends, and work colleagues. My Commitment to You As my client, my commitment to you is unconditional. I will bring you a professional level of excellence and value that is unmatched in our industry. 5 What You Get Communication Your needs always come first. I will provide the service we agree to and communicate in the ways that work for you, whether once a week, once a day, by phone, or text message. That's how we'll do it. You'll always be kept in the loop. 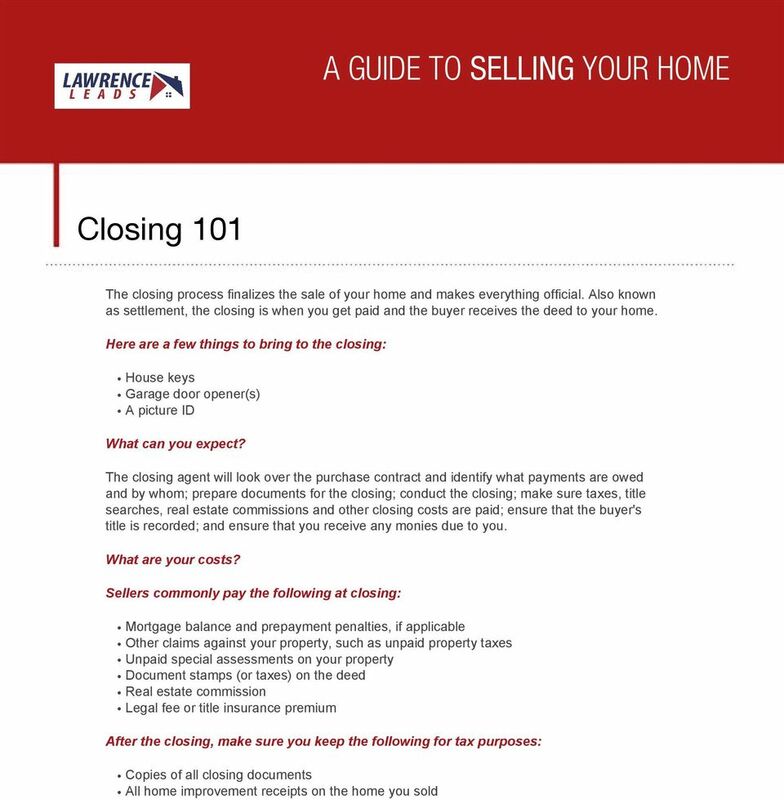 From listing to closing, you'll know the status of our marketing efforts, the offers on the table and the steps leading to a successful closing once an offer is accepted. Experience and Expertise The complexities of your real estate transaction will be well-handled. Smoothing the way for your listing and sale, I will capably remove many potential challenges before they have the opportunity to appear. Marketing Your home will get the exposure it deserves. 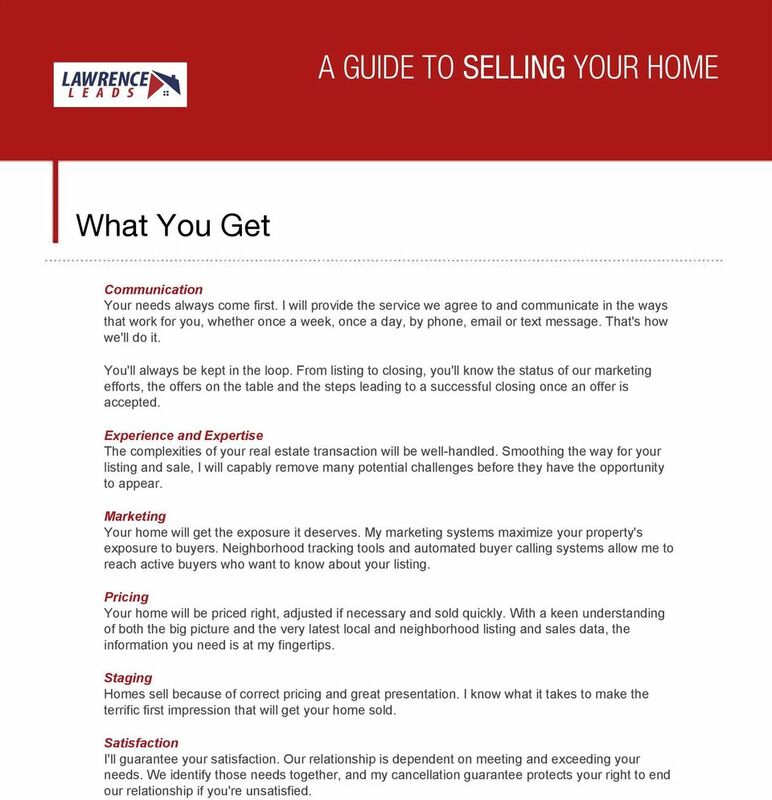 My marketing systems maximize your property's exposure to buyers. Neighborhood tracking tools and automated buyer calling systems allow me to reach active buyers who want to know about your listing. Pricing Your home will be priced right, adjusted if necessary and sold quickly. 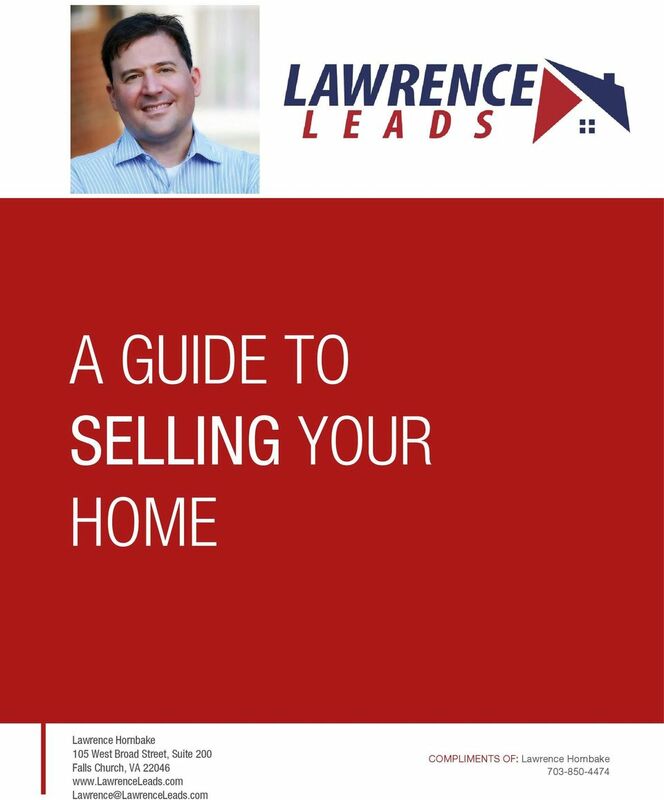 With a keen understanding of both the big picture and the very latest local and neighborhood listing and sales data, the information you need is at my fingertips. Staging Homes sell because of correct pricing and great presentation. 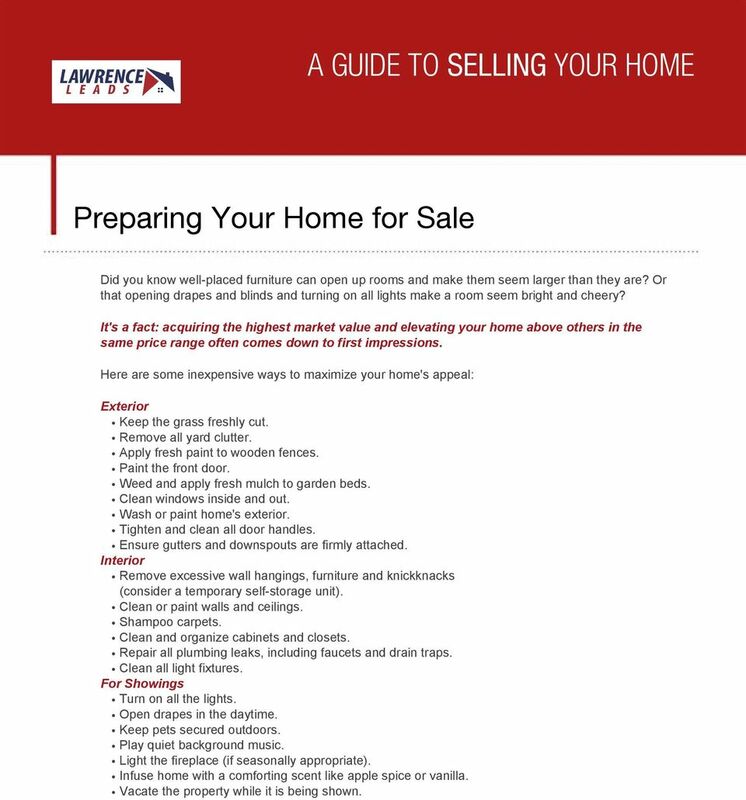 I know what it takes to make the terrific first impression that will get your home sold. Satisfaction I'll guarantee your satisfaction. Our relationship is dependent on meeting and exceeding your needs. We identify those needs together, and my cancellation guarantee protects your right to end our relationship if you're unsatisfied. 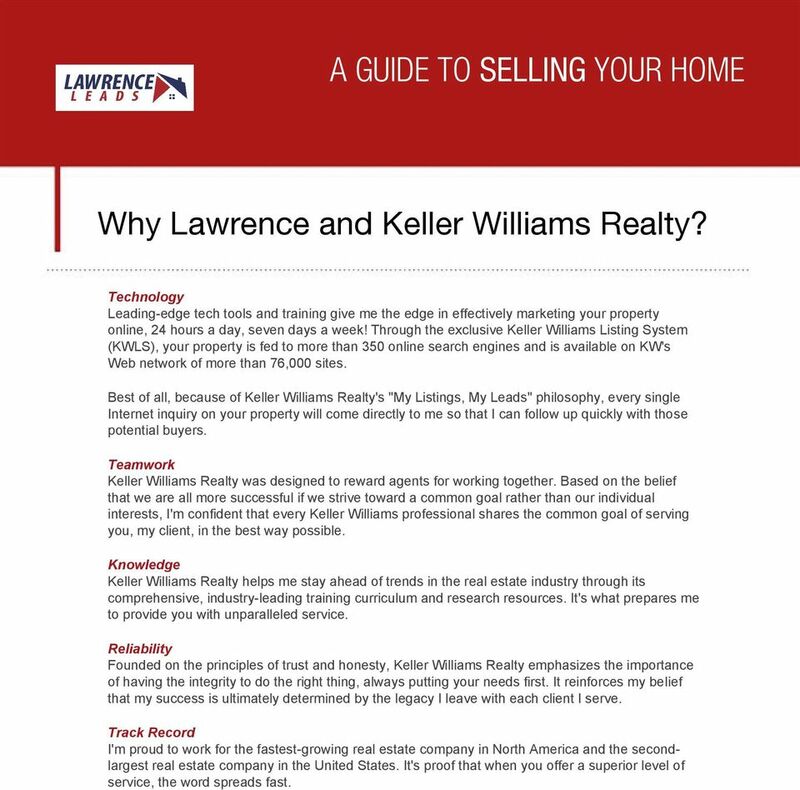 6 Why Lawrence and Keller Williams Realty? Technology Leading-edge tech tools and training give me the edge in effectively marketing your property online, 24 hours a day, seven days a week! 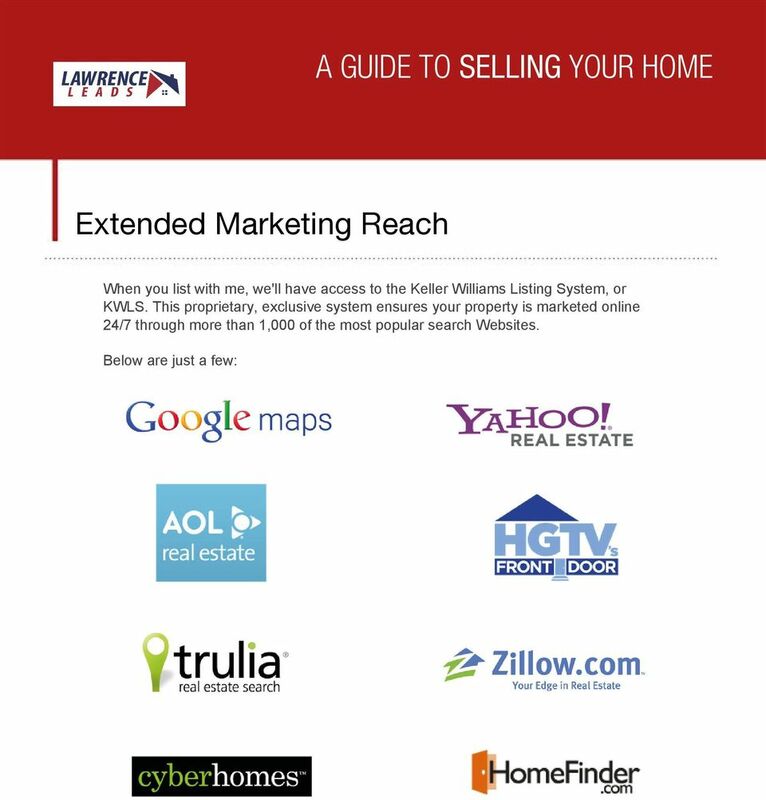 Through the exclusive Keller Williams Listing System (KWLS), your property is fed to more than 350 online search engines and is available on KW's Web network of more than 76,000 sites. Best of all, because of Keller Williams Realty's "My Listings, My Leads" philosophy, every single Internet inquiry on your property will come directly to me so that I can follow up quickly with those potential buyers. Teamwork Keller Williams Realty was designed to reward agents for working together. Based on the belief that we are all more successful if we strive toward a common goal rather than our individual interests, I'm confident that every Keller Williams professional shares the common goal of serving you, my client, in the best way possible. Knowledge Keller Williams Realty helps me stay ahead of trends in the real estate industry through its comprehensive, industry-leading training curriculum and research resources. It's what prepares me to provide you with unparalleled service. Reliability Founded on the principles of trust and honesty, Keller Williams Realty emphasizes the importance of having the integrity to do the right thing, always putting your needs first. It reinforces my belief that my success is ultimately determined by the legacy I leave with each client I serve. Track Record I'm proud to work for the fastest-growing real estate company in North America and the secondlargest real estate company in the United States. It's proof that when you offer a superior level of service, the word spreads fast. 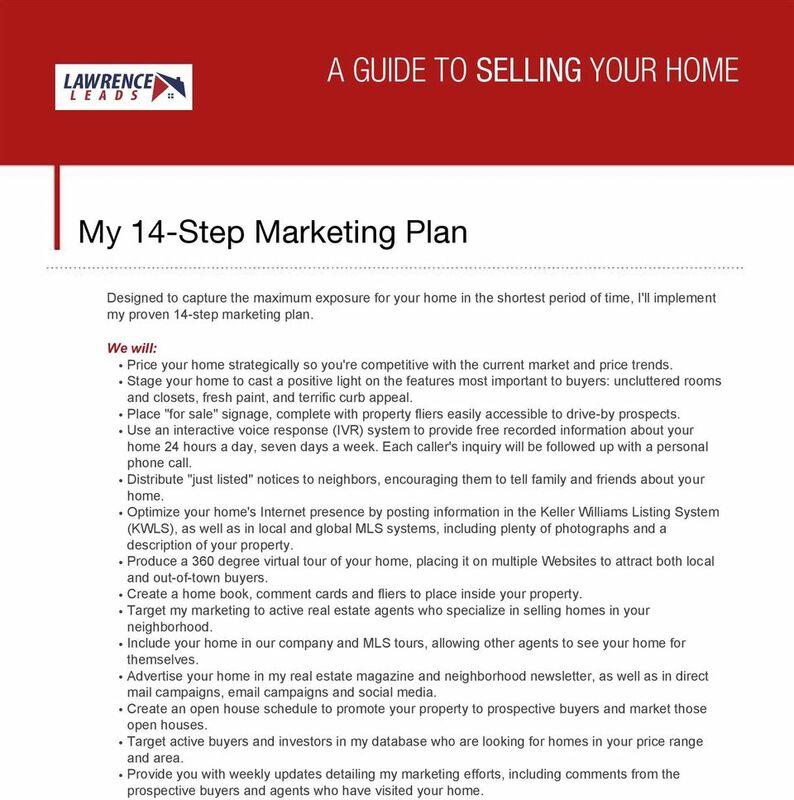 7 My 14-Step Marketing Plan Designed to capture the maximum exposure for your home in the shortest period of time, I'll implement my proven 14-step marketing plan. We will: Price your home strategically so you're competitive with the current market and price trends. Stage your home to cast a positive light on the features most important to buyers: uncluttered rooms and closets, fresh paint, and terrific curb appeal. Place "for sale" signage, complete with property fliers easily accessible to drive-by prospects. Use an interactive voice response (IVR) system to provide free recorded information about your home 24 hours a day, seven days a week. Each caller's inquiry will be followed up with a personal phone call. Distribute "just listed" notices to neighbors, encouraging them to tell family and friends about your home. Optimize your home's Internet presence by posting information in the Keller Williams Listing System (KWLS), as well as in local and global MLS systems, including plenty of photographs and a description of your property. Produce a 360 degree virtual tour of your home, placing it on multiple Websites to attract both local and out-of-town buyers. 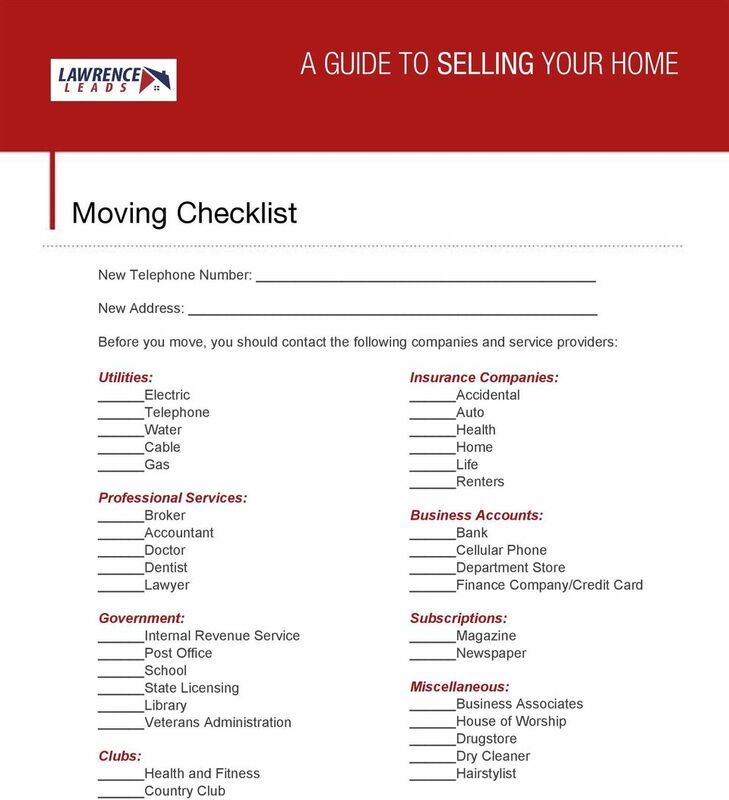 Create a home book, comment cards and fliers to place inside your property. Target my marketing to active real estate agents who specialize in selling homes in your neighborhood. Include your home in our company and MLS tours, allowing other agents to see your home for themselves. Advertise your home in my real estate magazine and neighborhood newsletter, as well as in direct mail campaigns, campaigns and social media. Create an open house schedule to promote your property to prospective buyers and market those open houses. Target active buyers and investors in my database who are looking for homes in your price range and area. Provide you with weekly updates detailing my marketing efforts, including comments from the prospective buyers and agents who have visited your home. 9 A GUIDE TO SELLING YOUR HOME Taking Open Houses Beyond the Basics Holding an open house is serious business. 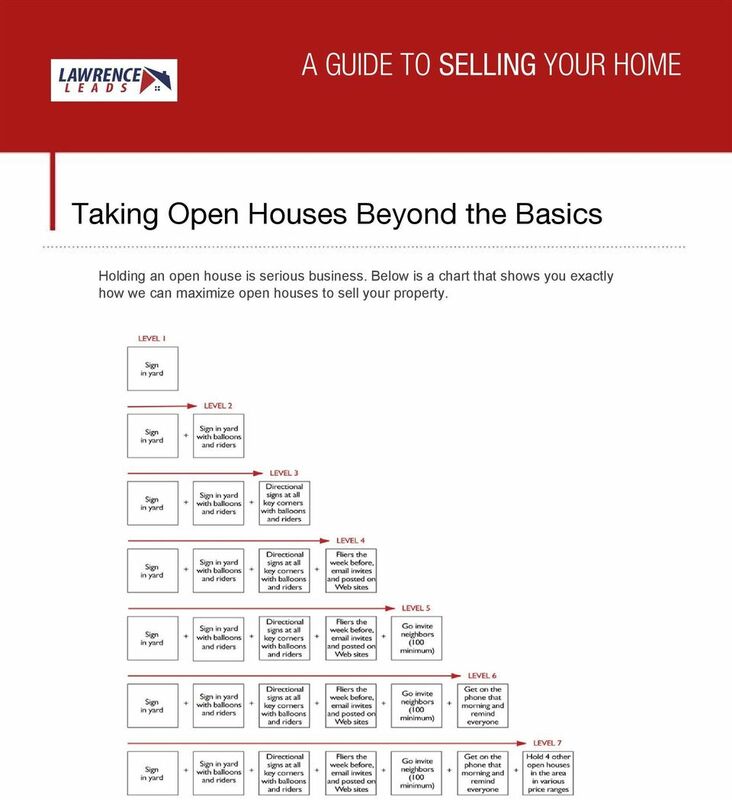 Below is a chart that shows you exactly how we can maximize open houses to sell your property. 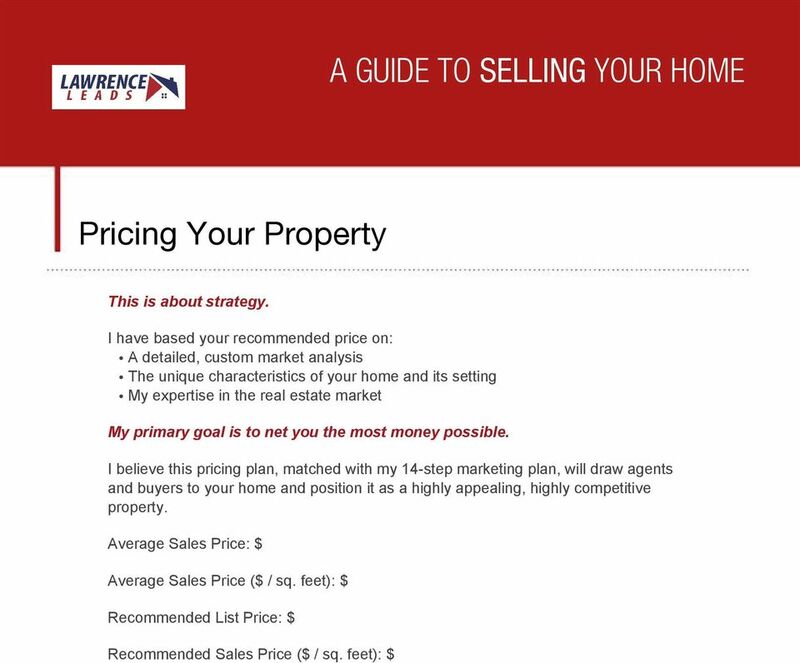 10 A GUIDE TO SELLING YOUR HOME Price Right Attract Buyers Pricing your property competitively will generate the most activity from agents and buyers. Pricing your property too high may make it necessary to drop the price below market value to compete with new, well-priced listings. 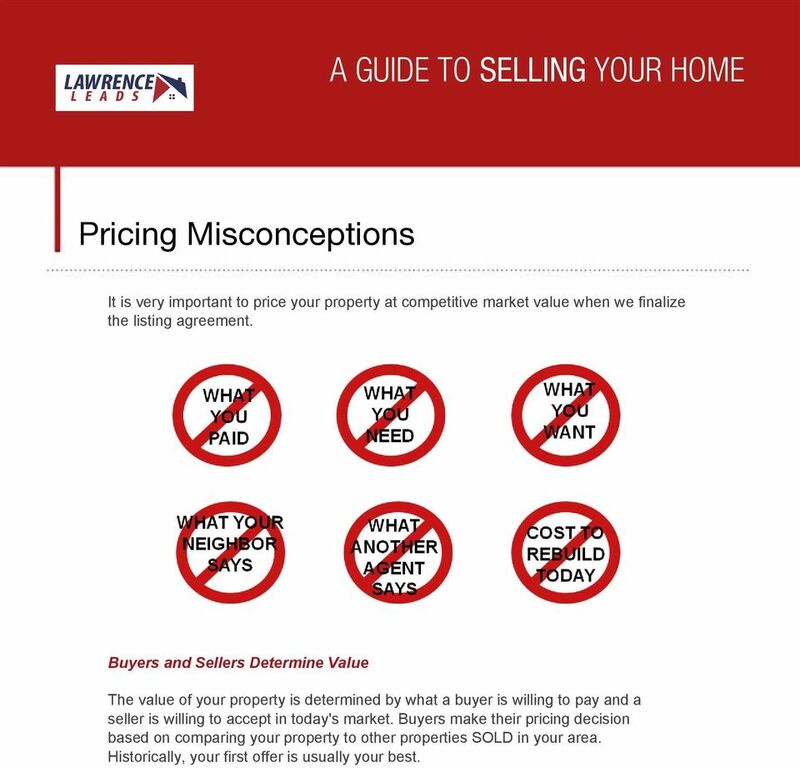 11 A GUIDE TO SELLING YOUR HOME Pricing Misconceptions It is very important to price your property at competitive market value when we finalize the listing agreement. 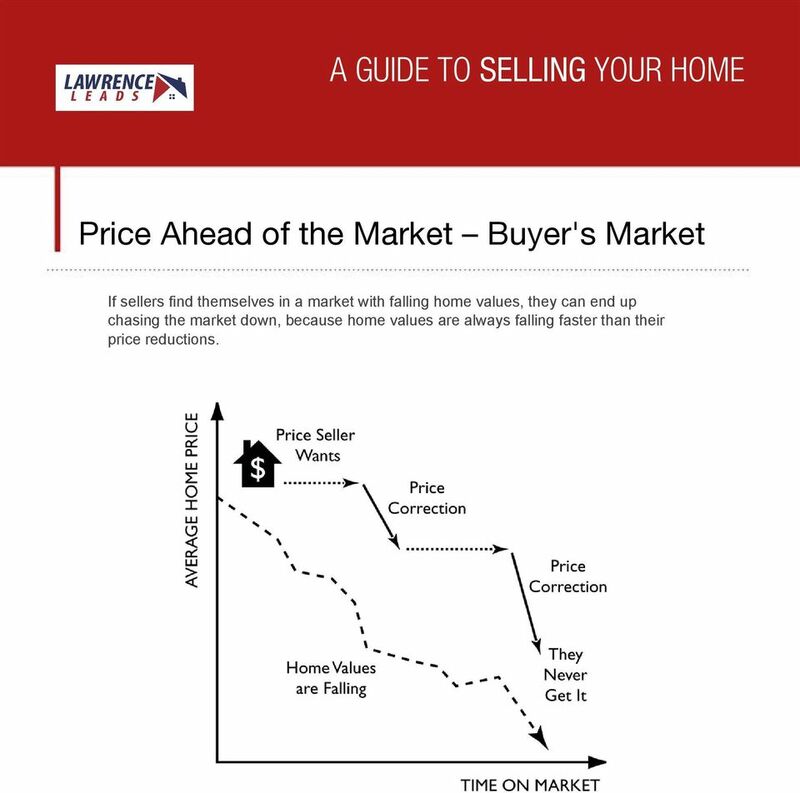 Buyers and Sellers Determine Value The value of your property is determined by what a buyer is willing to pay and a seller is willing to accept in today's market. Buyers make their pricing decision based on comparing your property to other properties SOLD in your area. Historically, your first offer is usually your best. 12 A GUIDE TO SELLING YOUR HOME Price Ahead of the Market Buyer's Market If sellers find themselves in a market with falling home values, they can end up chasing the market down, because home values are always falling faster than their price reductions. 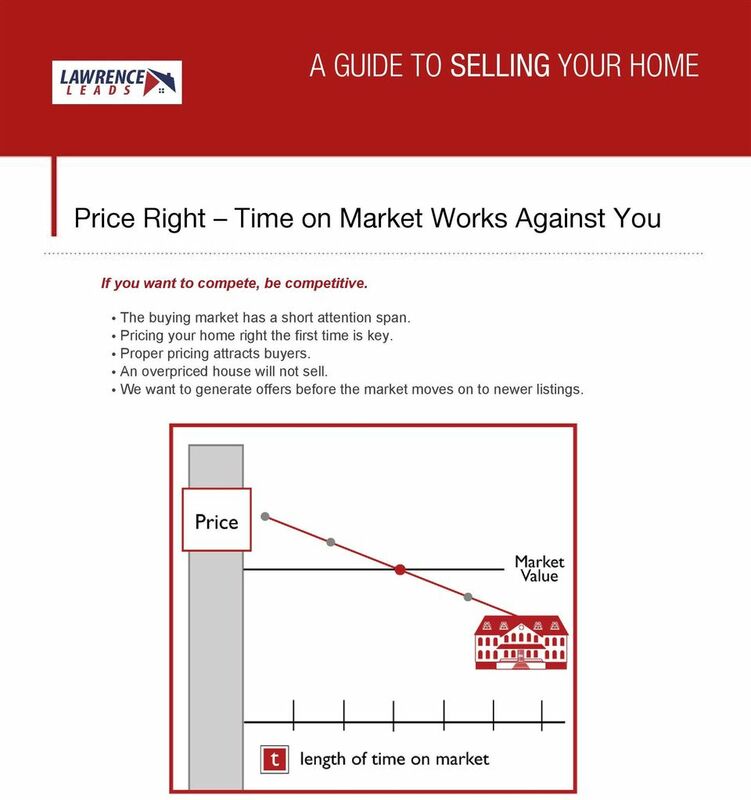 13 A GUIDE TO SELLING YOUR HOME Price Right Time on Market Works Against You If you want to compete, be competitive. The buying market has a short attention span. Pricing your home right the first time is key. 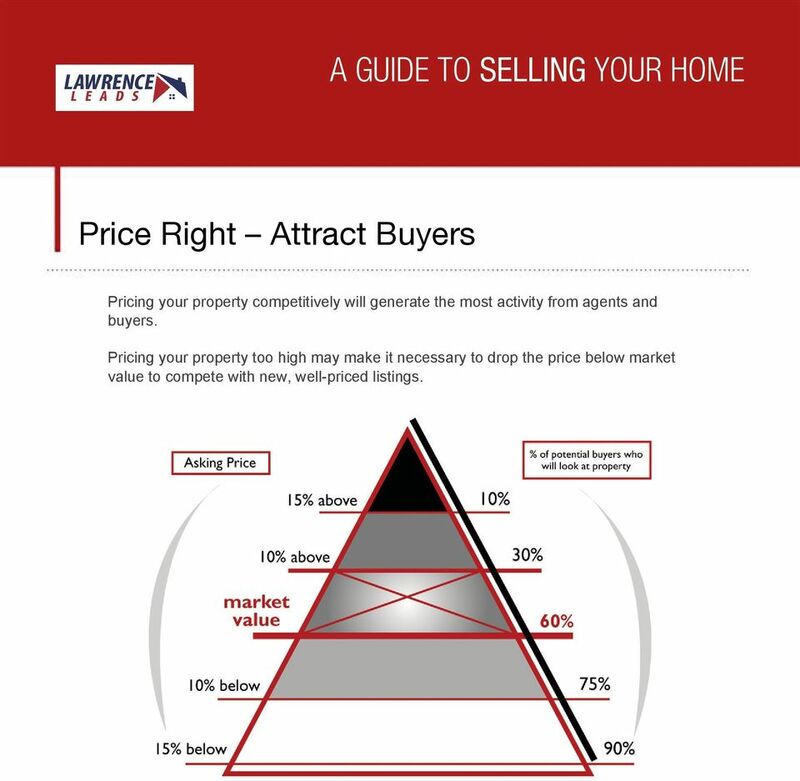 Proper pricing attracts buyers. An overpriced house will not sell. We want to generate offers before the market moves on to newer listings. 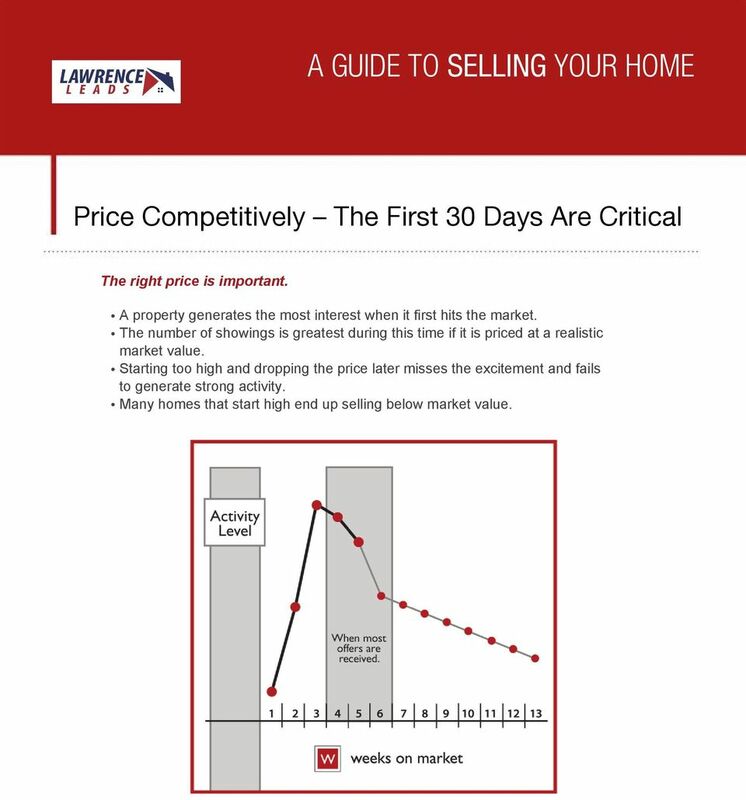 14 A GUIDE TO SELLING YOUR HOME Price Competitively The First 30 Days Are Critical The right price is important. A property generates the most interest when it first hits the market. The number of showings is greatest during this time if it is priced at a realistic market value. Starting too high and dropping the price later misses the excitement and fails to generate strong activity. Many homes that start high end up selling below market value. 16 Preparing Your Home for Sale Did you know well-placed furniture can open up rooms and make them seem larger than they are? Or that opening drapes and blinds and turning on all lights make a room seem bright and cheery? It's a fact: acquiring the highest market value and elevating your home above others in the same price range often comes down to first impressions. Here are some inexpensive ways to maximize your home's appeal: Exterior Keep the grass freshly cut. Remove all yard clutter. Apply fresh paint to wooden fences. Paint the front door. Weed and apply fresh mulch to garden beds. Clean windows inside and out. Wash or paint home's exterior. Tighten and clean all door handles. Ensure gutters and downspouts are firmly attached. Interior Remove excessive wall hangings, furniture and knickknacks (consider a temporary self-storage unit). Clean or paint walls and ceilings. Shampoo carpets. Clean and organize cabinets and closets. Repair all plumbing leaks, including faucets and drain traps. Clean all light fixtures. For Showings Turn on all the lights. Open drapes in the daytime. Keep pets secured outdoors. Play quiet background music. Light the fireplace (if seasonally appropriate). Infuse home with a comforting scent like apple spice or vanilla. Vacate the property while it is being shown.